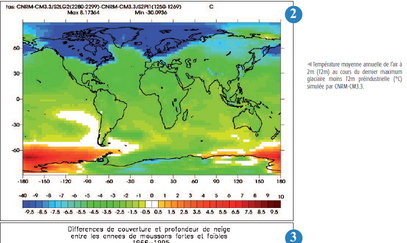 Past and future climate changes and variability can be assessed by using global climate models. These climate models can be typically run for time periods spanning a few years to a few millenia. They represent the global earth system, which is a complex interplay between its different components: the ocean, the atmosphere, sea ice, continental surfaces, rivers, vegetation, biogeochemistry... the different parts of this earth system can be represented by numerical models, developed by specialised researchers and engineers. These models are based on the laws of physics and are extensively tested in order to check that they represent the real system correctly. Climate simulations are not always performed on the global scale. For example, in the case of climate change simulations, more detailed information about possible rain or temperature changes is sometimes needed on a regional scale, e.g. the Mediterranean Sea, Europe, West Africa or the Arctic. Regional climate models can provide this information, allowing to better assess socio-economic impacts of climate change. Climate models can also be applied to produce seasonal climate predictions. Starting from the observed state of the climate system (surface ocean, atmosphere...), it is possible to determine seasonal climate trends a few months in advance in some regions. These seasonal predictions turn out to be more reliable in the tropics than in mid-latitudes and polar regions, and more reliable to predict temperature than precipitation.